A while ago on this web site, I mentioned my interest in the early history of hockey broadcasts on the radio. Mostly, that relates to the very first broadcasts in 1923 and trying to uncover if there’s anything earlier than the known broadcasts from Toronto that February. Well, this doesn’t pertain to that, but I did find it interesting. With ratings down all season for hockey broadcasts on Rogers Sportsnet, and as the playoff ratings are said to be taking a huge hit with no Canadian teams involved, let’s take a look back to when national hockey broadcasts began. The Sunday Times-Signal of Zanesville, Ohio, on September 2, 1928. 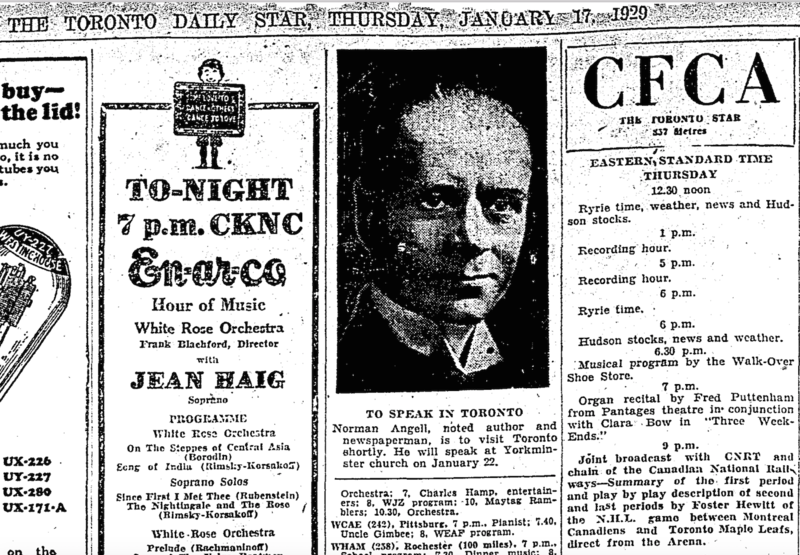 The first national hockey broadcasts in Canada have long been attributed to the nationwide hookup for the opening game from Maple Leaf Gardens on November 12, 1931. Some sources point to the General Motors Saturday night broadcasts that began in January of 1933 and were later taken over by Imperial Oil. These were the roots of Hockey Night in Canada. Turns out, however, that the first national broadcasts (much like the earliest broadcasts in 1923) were actually made from the Arena Gardens on Mutual Street. Fittingly, it was a game between the Toronto Maple Leafs and the Montreal Canadiens. The date was January 17, 1929 – almost three years before the opening of Maple Leaf Gardens. 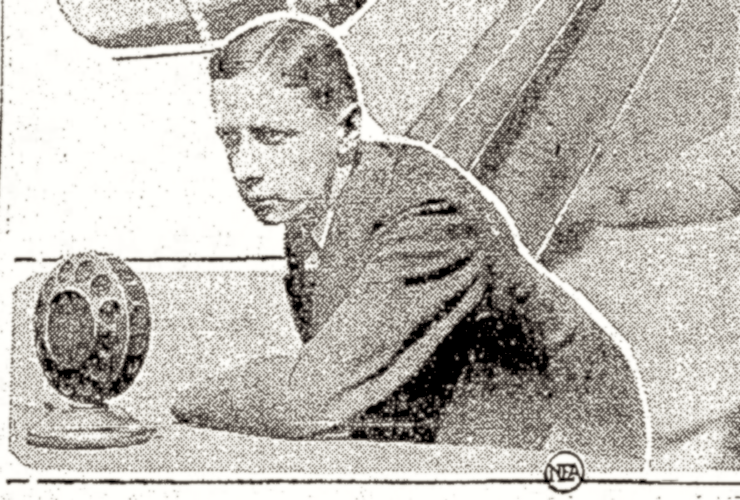 Foster Hewitt began his nationwide broadcast at 9 o’clock in Toronto. Your research continues to amaze me. Interesting info as always. As for the West coast, as far as I know broadcasting of sports and particularly hockey, started in December 1924. So the Eastern record is still safe. Oh, boy, I loved this one, Eric! I confess to being a frustrated radio announcer myself, and for a long time kept a collection of old radio: speeches, drama, some sports. In answer to your next question, no, my collection has long since found its way to the New Harbor Dump, the victim of Angry Spouse Ultimatum #17. One of my favorite childhood memories, however, is curling up in my Dad’s car (a purple DeSoto with hideous tail fins – what was he thinking?!) listening to the Bruins – Habs broadcasts. Where we lived that was all we could pick up. I was a Gallivan man myself, and I loved every second until the earlier of (a) the Canadiens got a 4 goal lead or (b) the thermometer dropped below zero F.
I predicted what has happened when Sportsnet went ga-ga! Did none of those people ever learn the pre-requisite to Sales & Marketing 101? It’s something called ‘SUPPLY & DEMAND’! I wonder if they ever heard of it. Apparently not because a glut of anything KILLS its market value. They should have talked to OPEC! Foster Hewitt was the ‘voice’ of Hockey! I used to really enjoy his commentating. Borje Salming……my idol…..And I adored the Maple Leafs….